Roberto Mancini has done his best to play it all down. "This game is not Mourinho-Mancini or Mancini-Mourinho. This game is Real Madrid-Manchester City," was his response to a recent question. And yet in a Champions League tie filled with sub-plots and side stories, there is a fascination in seeing Europe's two most highly paid managers pit their wits against each other at the Bernabeu. They have met as managers only once before when Mancini's Lazio played Porto nine years ago in the Uefa Cup. Jose Mourinho came out on top on that occasion - despite a touchline ban for the second leg - to lead his team to his first European trophy. They have not met since that match in 2003 and yet there is a sense that a rivalry and tension has developed even without direct confrontations. Despite that, their respect for each other is without question. "Jose is one of the best in the world," Manchester City boss Mancini said of his Real Madrid rival. "But people should forget the managers. It's the players who will decide the game. What happens outside the pitch is not important." The parallels between both men are clear to see, right down to their tailored coats and penchant for distinctive scarves. Both have turned ambitious and extremely wealthy English football clubs into title winners and both led Inter to the coveted Serie A scudetto. And yet when you look more closely, there are also notable differences. Lots of them. As a player, Mourinho was a relative pauper, lacking the ability to follow in his father's footsteps and turn professional. Mancini was the prince, an outlandish talent, a cavalier and a character during a glittering career with Sampdoria, Lazio and Italy that led his adoring fans and compatriots to claim he was "baciato dalla grazia" or "kissed by good fortune". It is Mourinho, however, who has had the upper hand in the managerial stakes, having won two Champions Leagues - with Porto in 2004 and Inter in 2010 - and league titles in Portugal, England, Italy and Spain, all carried off with an aura reminiscent of the greats of the past. But if Mourinho and Real represent the pinnacle of the game, established football royalty, Mancini and City are the upstarts, the nouveau riche who believe they can overthrow the established order. "We don't have the history of Real Madrid," Mancini added. "But Manchester City have won trophies in the past and the important thing is that I think we will win trophies now. Wait for the next 10 or 20 years. "We had to contend with Jose's management style, which was very effective. He did a fantastic job [at Chelsea]. You knew you were competing against a very clever manager. You weren't just facing the money, you were facing a very united squad. They were hard to beat. City are very similar to Chelsea at that time." "OK, we can't win like Real Madrid because they have been winning for 50 years. But we are winning things now and we want to continue that if it is possible. In the next 10 years I think Manchester City will become a top team like Real Madrid." Both men revel in football's mind games. On this occasion, Mourinho has fired the first shots. "Real Madrid is Real Madrid," he said. "It's the real thing. A club no football result, no cup competition, no coach, no player can ever change. Real Madrid is a club like no other. It's incomparable with any other club in the world. There is no team anywhere that can be compared with Real Madrid. None. "Remember I was in Portugal, England and Italy before coming here to Madrid, so I know what I am saying. There are great clubs but the pressure and the expectation is the greatest here at Real Madrid. It is huge but it is an enjoyable pressure, not a suffocating one." Neither man comes cheap but Mourinho remains something of a hired gun, whose trigger finger is known to become itchy every three of four seasons. Roman Abramovich craved a title at Chelsea, Inter longed for European dominance and Real Madrid wanted to overtake Barcelona. Mourinho made it happen and until now, moved on. Mancini, by contrast, is a builder. He likes a structure and a plan. It was Mourinho who led Inter to the Champions League, but Mancini laid the foundations in the three previous years. "I won seven trophies in three years but not the Champions League," Mancini added. "Sometimes it is not your moment. You prepare, but in this competition you need luck." The well-publicised tension between Mourinho and Mancini dates back to those days and the changing of the guard in 2008. That the "Special One" agreed a three-year deal to become manager of Inter before Mancini had left the San Siro has not been forgotten. Nor has Mourinho's claim that Mario Balotelli was "unmanageable". In many ways their differences as managers and men is borne out by their treatment of Balotelli. Mourinho made that statement about the fiery Italian, having grown tired of his nuances. Mancini picked up the pieces, rebuilt his raw talent, his fragile confidence and, with a few well-publicised exceptions, has reaped the benefit. "On a personal level I would say Mancini and then Mourinho," Balotelli said when asked to rate them as managers in January. "A coach has to bring 100% out of a player and Mancini is brilliant at doing just that. The Premier League has been a new experience, even if at first it was difficult. But if I have to tell the whole truth now, it's that I'm really happy." 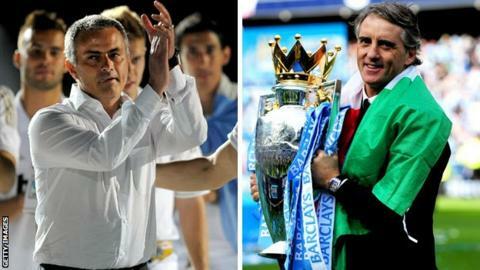 Mancini and Mourinho are different men, different managers. Where they find common ground is in their overriding and unquenchable passion for the game. Come kick-off, the cameras will train their lenses on the vast array of talent on the field - Cristiano Ronaldo, Xabi Alonso, Mesut Ozil, Yaya Toure, David Silva - the list goes on. But the dynamic in the dugout is likely to be just as compelling. Can Man City match Europe's elite? Read more on Can Man City match Europe's elite?